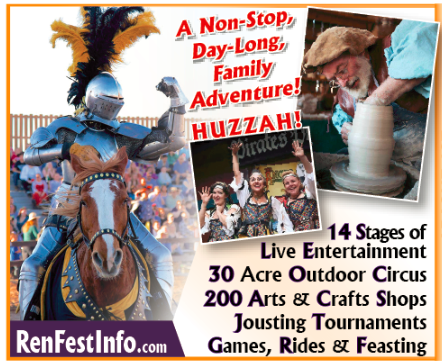 The 16th century festival is home to many popular traditions including chomping down on a giant roasted “turkey leg” or Cheering "HUZZAH" at the jousting tournament. The Marketplace features over 200 artisans displaying a variety of unique, hand-made wares. Watch as the ancient skills of glassblowing, leather work, weaving, woodcarving, blacksmithing, candle making and pottery are displayed...IT IS A SHOPPER'S PARADISE! Don't miss YOUR chance to Rub shoulders with ROYALTY! Remember to dress comfortably; wear sunscreen, drive safely-ENJOY THY TRIP BACK TO THE 16th Century!